American Bison ; The Great Plains once swarmed with bison — literally millions of them. The sight of these massive, shaggy beasts roaming the prairies is one of the most familiar and iconic images of North America. But the settlers who arrived on the plains in the nineteenth century killed bison in huge numbers. Within a few years, over fifty million bison had been wiped out, and by the end of the nineteenth century there were just a few thousand left. Since then, efforts have been made to conserve them and to increase their numbers, and today there are about two hundred thousand bison. 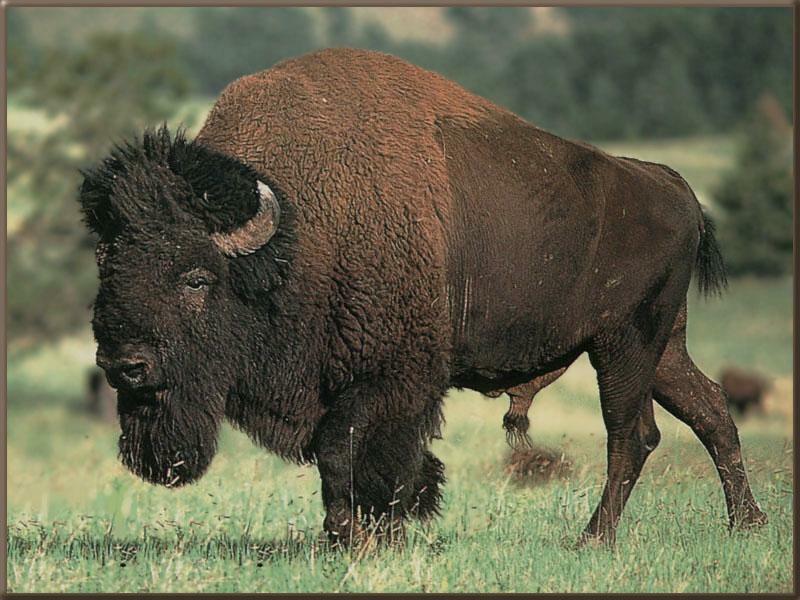 Bison may be the largest and heaviest land animals in North America, but they are quick on their feet. With their small rumps and long front legs they can run up to forty miles (64 km) an hour. They feed on plains grasses, herbs, shrubs, and twigs. Like cows, they regurgitate their food and chew it as cud before digesting it.